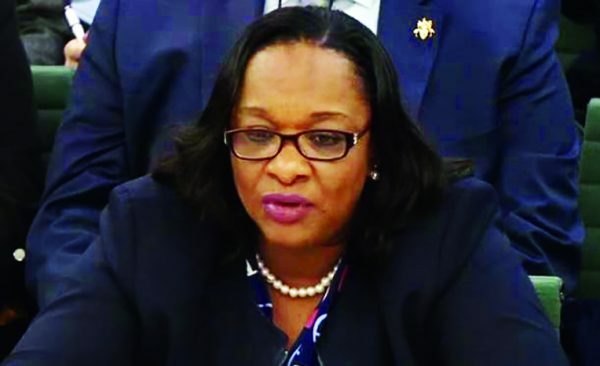 Jan 9, 2019 – Caribbeean News Service – The European Union has disbursed EC$17.55 million (€5.72M) to the Government of Montserrat (GoM) as the First Fixed tranche under the Multi Sector Sustainable Economic Development Budget Support Programme. 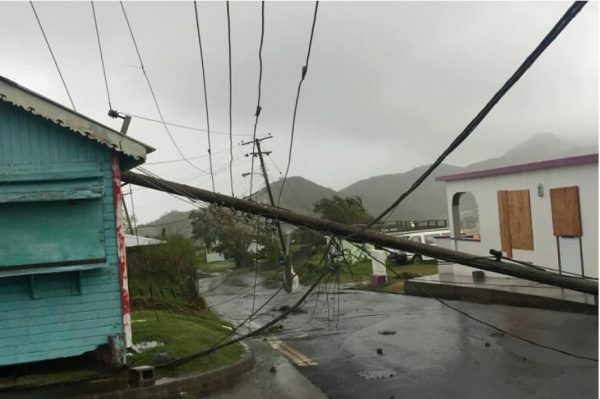 The assistance is inclusive of an emergency top-up payment of EC$1 million (€320,000) as additional support to help with the economic recovery of Montserrat after Hurricane Maria struck in September 2017. The overall programme (Grant) of the current 11 European Development Fund intervention is approximately EC$57.35 million (€18.72M). The programme is expected to run until 2022, with EC$54.30 million (€17.72M) earmarked for multi sector development as budget support. Montserrat also benefits from regional EU assistance for Overseas Countries and Territories (OCTs). 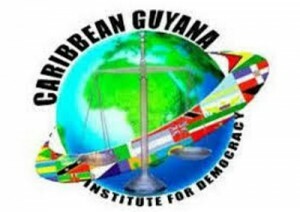 The Premier cited as a key sign of progress, coming from the testimony to the Foreign Affairs Committee (FAC) by Lord Ahmad, Foreign & Commonwealth Office (FCO) Minister for Overseas Territories, on December 18, 2018. 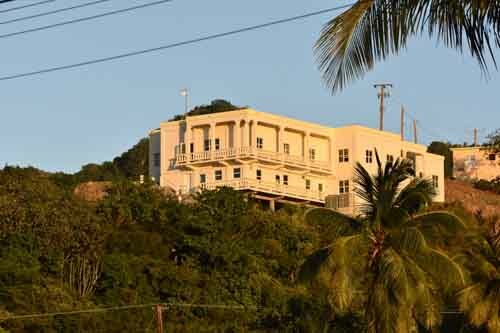 He noted that the Minister confirmed that along with the Secretary of State, (Penny Mordaunt) and his colleague Lord Bates, the view they are now taking involves much more long-term support of Capital projects in Montserrat as in each British Overseas Territory. 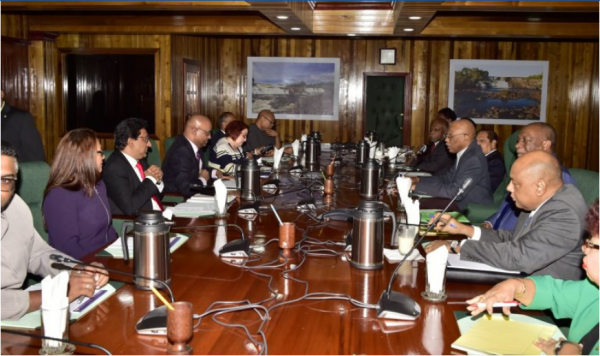 Indeed, it is confirmed from the inquiry with Lord Ahmad indicating to the Committee, that, in addition to the agreed funding for the Port expansion project, the UK government has agreed and is in detailed discussions regarding £30 Plus Million in capital aid for Montserrat. He acknowledged that Montserrat’s requirements were more like £50 Million. In his New Year statement, the Premier acknowledges on behalf of GoM as he thanks Lord Ahmad and Lord Bates for the critical role they have played so far in the negotiations over the 5-year Capital programme. 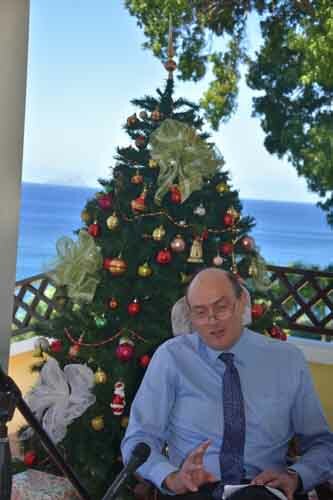 Minister of Communications and Works Paul Lewis, according to reports, in his Christmas message hinted on the same theme of a slow ‘on the ground’ movement of the projects. 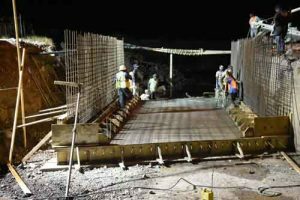 He said Montserrat development is not set in stone despite the government’s best aims to negotiate the best deal for Montserrat with funding partners. He then joins the Premier saying, it would take a joint effort to ensure that the truest form of development achieved for Montserrat. Posted on 24 December 2018. 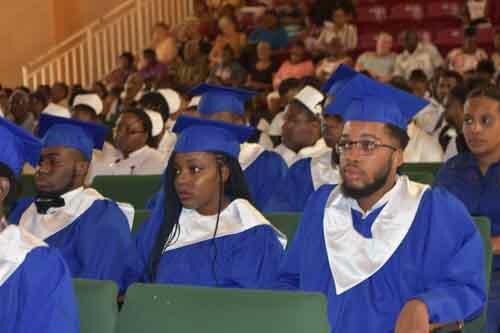 The Montserrat Community College in its usual business-like style, conducted its 2018 Graduation and Awards Ceremony, its 13th on Wednesday, December 19 at the Cultural Centre in Little Bay. 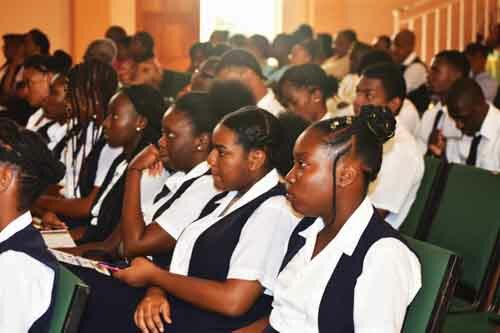 Principal Geraldine Cabey hailed by a student for her sternness, “a woman whose presence is like no other, a woman with voice is enough to send chills running you’re your spine…” she had some serious caution for the graduating and other college attendees. 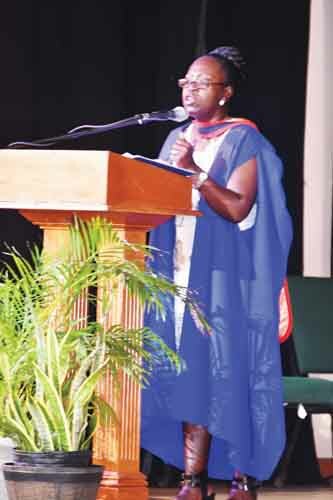 In her remarks and report, she informed that the Graduating class has created a new beginning for themselves, whether as a step-up on the next wrung of the academic ladder or as new entrants into the workforce…providing the distinct opportunity especially for our graduants, as well as the institution, to consciously reflect on the academic journey that would have culminated in this event. 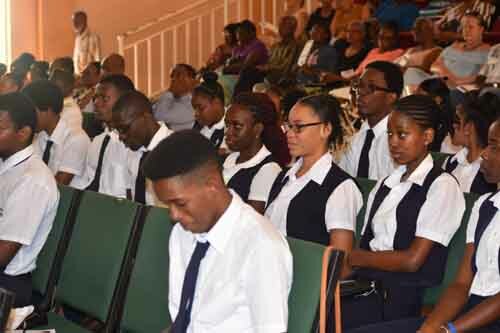 She reported 56 full time students pursuing 26 subject areas, in pursuit of the Caribbean Advance Proficiency Examination qualification at the Certificate, Diploma or associate degree level. 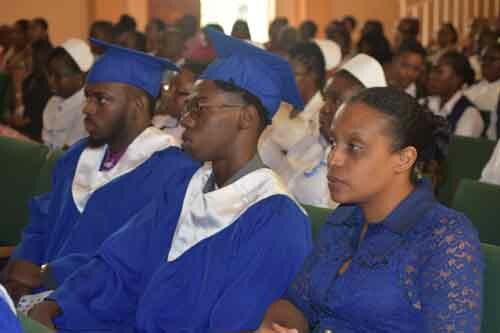 In addition, 25 part time students who pursued a combination of both advanced CAPE subjects and secondary level CSEC courses. 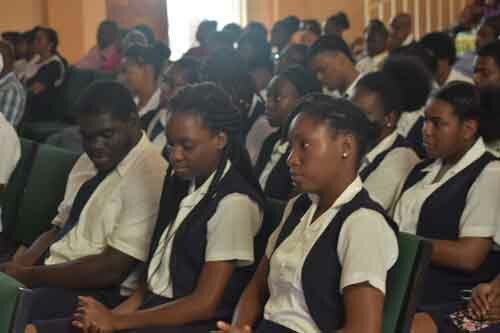 She reported an overall 92% subject pass rate for the June 2018 CAPE examinations, achieved by the graduating class together with the current second year students. 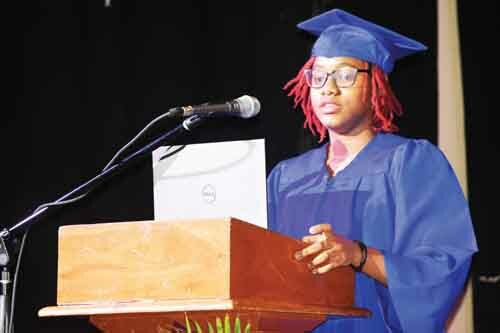 The most outstanding performer, the Valedictorian of the class of 2018, Miss JenAlyn Weekes, gained passes in twelve (12) CAPE Units over the two years she spent at the College. 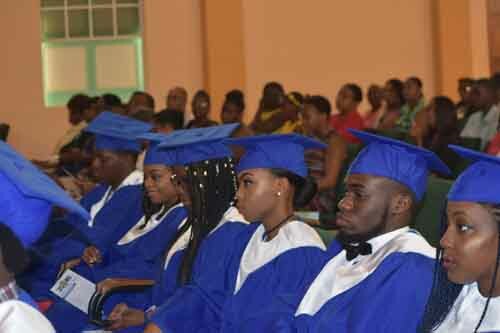 Miss Weekes, the principal said: “epitomizes the College’s Motto which is ‘Aspire, Apply, Achieve’”. A notable feature of the ceremony was that every participant was connected with the College, either past or present staff or student, to include Mr. and Mrs. Alfonso Lee for their ‘outstanding’ generosity to the college, in one instance, for painting buildings on the school compound. 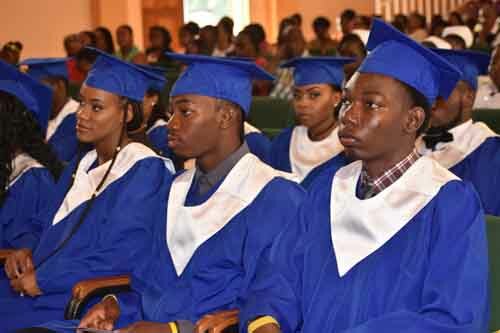 The master of ceremonies was Mr. Glenroy Foster who was a one of the first persons to graduate from the college before he moved on to pursue a master’s degree in civil engineering, and who now serves at the Ministry of Communication and Works. In his opening and welcoming remarks he said: “Graduation is a time where many reminisce on the years spent at the particular institution. “I would want to believe that the graduating class could remember times of happiness and sadness, the joyful times and the stressful times and more importantly the friends that they spent all of these times with. “There is no spoon feeding,” he told the students. Some entertainment was provided by one student, Miss Okessa Halley giving her rendition of the song ‘One Moment in Time’, accompanied at the piano by the accomplished (staff member) Miss Anne-Marie Dewar. 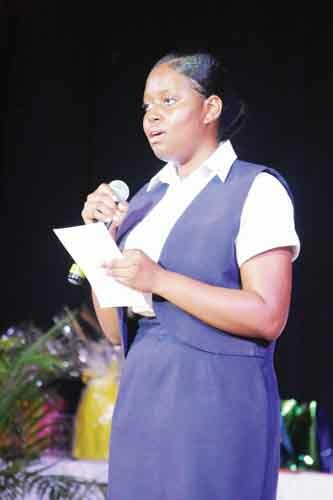 The keynote address, delivered by a graduate of the college of very recent years, Miss Nadia Browne. She was smooth in her admonishments, advice and encouragement. “Regardless of your choice,” she continued, “my message to you this evening centers around your personality. As we hear of the turmoil in other parts of the world and look at the state of our nation, it is evident that society needs its youth to exhibit such qualities as integrity, vision, selflessness, dedication, cooperation and a host of others to function properly. “Take a moment to think about the person you want to be,” Nadia offered. “Who is that person in society? What will it take for you to become that person? Eventually, you will all be a part of the workforce. In spite of the accolades or lack thereof you gained from your scholastics, you will have to prove yourself to be a competent worker, quick learner and cooperative team-member. What do you want your co-workers to say of you? “Would you rather be known as the worker who does not shy away from a challenge or the person who is only at work because he or she needs to be paid? There was plenty beyond this. “Who do you think Montserrat needs you to be? An innovator? A peacemaker? An activist? A negotiator? How can the talents you have been blessed with be used to make your nation better?” leaving an audience and college students, impossible not taking something away. Nadia closed: “I hope that at least something that I said tonight will resonate with you… Congratulations once again. I look forward to working alongside you to improve our nation and world.” (See her address here online at www.themontserratreporter.com) with the story. 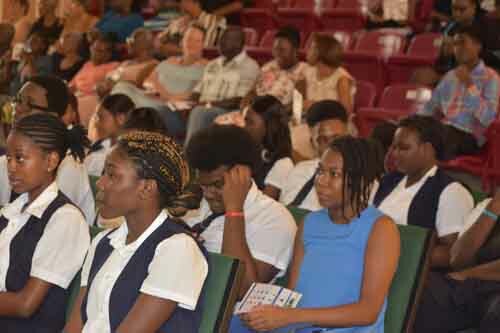 The prizes, certificates and awards for all students were delivered with the able assistance of Mrs. Oslyn Jemmotte a past Registrar and bursar at the college. 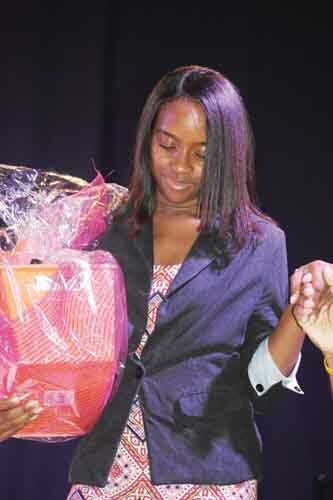 The valedictorian, Miss JenAlyn Weekes was humble as she acknowledged her title of achievement. “I see myself as a representative of a group of valedictorian…” At the end she added: “I wish to urge members of this class, to be grateful for the foundation that his been set and to go out there anad soar like an eagle and accomplish great things,” thanking all those including staff etc, parents and all those who contributed to the journey so far. The recession of the now graduates, no longer graduants, followed. There was this retired public servant gentleman with whom I was having a discourse about some specifics about the state of Montserrat. He/we concluded that missing is an education which will come through information and discussions among people. So, he suggested the use of Facebook. I promptly noted that Facebook, in its setting is good for rallying groups together, but in a general way does not reach as many people, certainly not all the people, often those for the masses to whom certain material and important matters are targeted. I reminded that Facebook is a great tool for what it is good for. I offered my usual description – It is about entertainment, gossip and mischief…varying information which should be always verified. But as suggested it is a good meeting place to exchange thoughts and information among those willing to participate. It has been suggested often, that TMR in fact had the first Facebook back in the 90s. It is here, that some posts and comments caught my attention that I felt compelled to share, especially with our readers who otherwise would not know about. The matter though only recently highlighted was first aired at Governor’s coffee morning with the media on September 26. 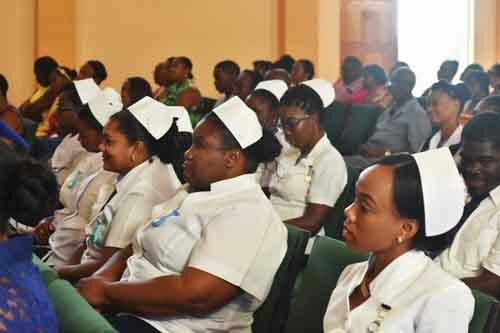 The Governor took aim at the number of consultancies done on the island and some of the needless processes in the public sector …that the bureaucratic red tape inherited from the U.K. is stifling development. of British civil servants over the years. when the candidate was ready to retire. and studies of studies (consuming our aid). since the service is in his purview and portfolio. that he is not afflicted with like paralysis. The (our) celebrated poet, satirical at times, as can be, and would be expected, got support and reactions. One of our very active and knowledgeable, insensibly exiled journalist, with BBC and regional fame, was first to react. My thoughts as posted elsewhere. 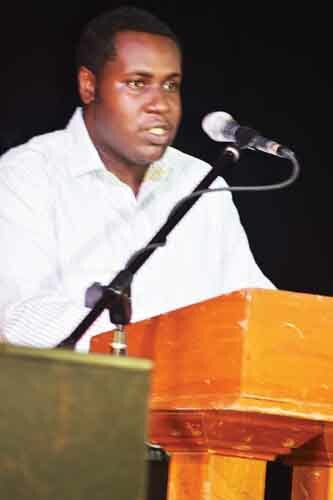 “The Governor of Montserrat is right. The present model is wrong. On the outmoded and unnecessary time-consuming administrative requirements imposed on a micro local government in a micro territory, how much of this now needs a massive rethink? How much needs to be referred to the administrative authority – as is done in the UK Nations and Regions, councils and local governments – so that the local administration and civil service can focus on the priority local issues? Is it not time for a realistic new partnership with the UK central government, especially in Montserrat’s case? And they all in unison, exclaimed, “Lord help us”. Very well put. Sir Howard… my very short visit to the rock last week. Have a blessed, inspired and productive day. Sir Howard Fergus. The Conscience concurs with your sentiments. But we can’t wait to DIE before (they) fix it. We must find a way. OURSELVES. British Prime Minister Theresa May leaves No. 10 Downing Street on Dec. 5. 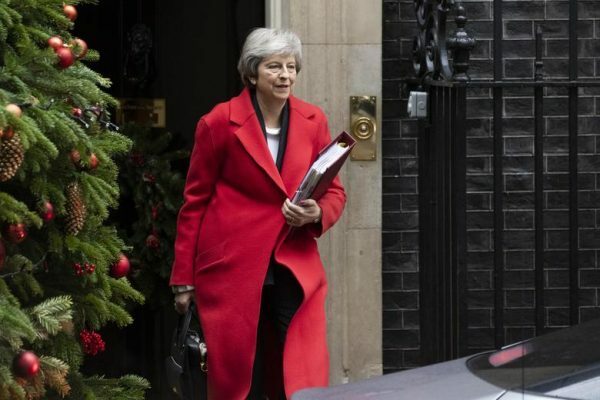 “Quite frankly a bit of a shambles” was the understated response from one of Theresa May’s coalition partners to the news Monday that the prime minister seeks to delay a vote on her Brexit deal, which had been planned for tomorrow. The delay reflects May’s acknowledgement that she doesn’t have the votes for the controversial deal she negotiated with Brussels, which would keep Britain in a customs union, at least for a time, with the EU, in order to avoid the imposition of a hard border between Northern Ireland and the Republic of Ireland. The deal is opposed not only by the opposition Labour and Scottish National parties but also by her coalition partners, the Northern Irish Democratic Unionist Party and many hard-line Brexiteer members of her own Conservative Party. Both Labour and the Scottish National Party have suggested that a motion of no confidence in May’s government could be put forward this week. According to the Guardian, “the vote could take place next week or even be delayed until early January, although this would allow less time for the ensuing Brexit legislation to be passed through parliament before 29 March,” when Britain is due to leave the EU, deal or no. Time is running short, and the delay raises the likelihood of a “no-deal” Brexit in which Britain would revert to trading with Europe under WTO rules, a prospect that experts have warned would have dire consequences for the British economy. The pound fell 0.5 percent against the dollar Monday in response to the news. The delay will give May some more time to lobby reluctant lawmakers, and she has also suggested that the so-called “Northern Ireland backstop” could be modified. An EU spokesperson insisted, however, that the deal on the table is “the best and only deal possible” and would not be renegotiated. Given the knottiness of the Irish border problem, it’s not quite clear what an alternative arrangement would even be. But the important thing to remember in the Calvinball world of Brexit is that no one actually knows what the rules are because no one has ever done this before. The EU has already compromised more than many expected in agreeing to the customs union arrangement. After insisting for months that “Brexit means Brexit,” May also agreed to a much closer future economic relationship between Britain and the EU than was anticipated. Both sides also seem to be making quiet preparations for postponing Brexit past March, after long insisting that the deadline was nonnegotiable. At the moment, a host of scenarios—including a no-deal Brexit, some alternative compromise on the Irish question, a delayed Brexit, a new “people’s vote” referendum on the deal, and an ouster of May leading to who knows what—all seem entirely plausible. 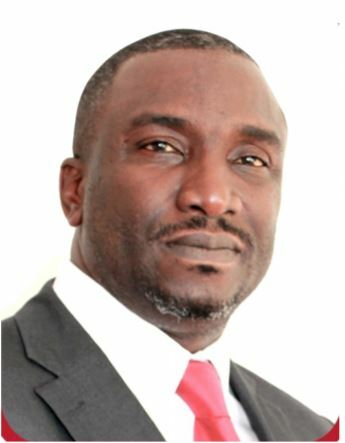 Premier Donaldson Romeo of Montserrat was the last in line during the Foreign Affairs Committee- Oral evidence: Future of the UK Overseas Territories, HC 1464 delivered on Wednesday, 5 December, 2018, Ordered by the House of Commons to be published on the said date. The Members of the UK Government present: Tom Tugendhat(Chair); Ian Austin; Mike Gapes; Ian Murray; Priti Patel; Andrew Rosindell; and Royston Smith. There was a second round of oral evidence was taken immediately from the other OTs present for that purpose. 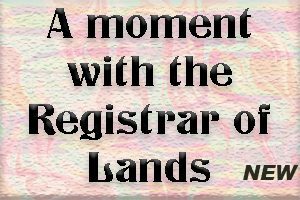 They were: Councilor Leslie Jaques OBE, Government of Pitcairn Islands, Councilor Derek Thomas,Member of the Legislative Assembly, Mr. Ian Lavarello, Chief Islander of Tristan da Cunha, and Councilor Keturah George, Ascension Island Council. He elaborated very briefly, hitting on some common issues which throughout became speaking points: “ We are not foreign; neither are we members of the Commonwealth, so we should have a different interface with the UK that is based on mutual respect…I think it is important when we make a criticism always to make some suggestions about how best to advance our concerns. I would like us to consider a more appropriate Department to interface with Anguilla, such as the Cabinet Office, as we are neither a foreign state nor a member of the Commonwealth…I would like a Minister to be appointed with the British Overseas Territories as their sole brief. No surprise that the next ‘witness’ Miss Barkman from the Falkland Islands spoke with a different context eventually highlighting some common issues shared with the other OTs, but showing that they were more advanced in their relationship with the UK. “It is important that the constitutional relationship between the UK Government and its Overseas Territories is routinely reviewed. It is vital that the relationship reflects the present realities in both the UK and its Overseas Territories. In the light of that, and in the light of Brexit in particular and other recent events, we welcome this inquiry,” she began. She developed to a close as she shared that in March 2013, 99.8% of Falkland islanders, on a turnout of92%—I am reiterating the point, voted to remain a self-governing Overseas Territory of the United Kingdom. That remains the settled and very powerful voice of Falkland Islanders. Next, Hon. 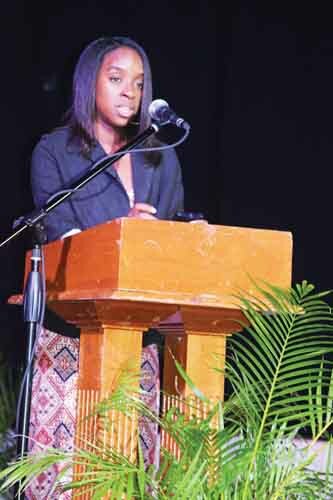 Premier Sharlene Cartwright Robinson, who introduced that she was accompanied by the Turks and Caicos Islands deputy Premier. She was more brief than the others but later delved more heavily into the discussions. Q185 Andrew Rosindell: How can it be effective for you as British citizens in British territories to be lumped into the Foreign and Commonwealth Office when you are not foreign and you are also not members in your own right of the Commonwealth? You are appearing in front of a Foreign Affairs Select Committee in a Parliament in which you have no say and no influence on anything, where laws can be imposed upon you without any democratic accountability. Do you not agree with me that the time has come to modernise the relationship completely and treat all territories equally as British? Q167 Priti Patel: … Could you please, in the few minutes you have, extol the virtues, if there are some, of being a British Overseas Territory, whether or not you consider your territory to be part of the United Kingdom? As we will unpack during this evidence session, where do you think the areas off blockage exist on the very points you have already made in your representations? Premier, why don’t we start with you? 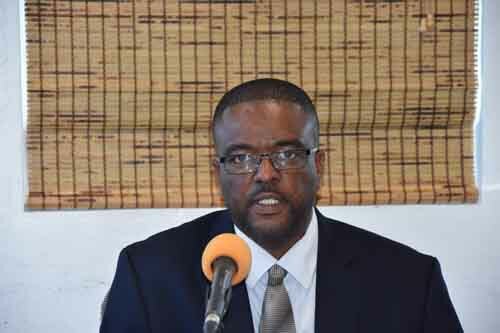 Donaldson Romeo: I would say the policies declaredb y British Government and already in place are perfect; in Fact, some refer to Montserrat particularly. However, Majesty’s Government are not implementing the policies as they state them. Having first call on British aid is atremendous advantage, but it does not really happen in real life. Donaldson Romeo: (Later) I support Andrew Rosindell’s keen desire to see Montserrat and other Overseas Territories better represented. I think there needs to be some action in that direction, such as a special committee that focuses on us, allows us to present questions to Parliament and the like.I really think something needs to happen. However, please realise thatpoliticians on your end make decisions for your constituents and your voters,and we are forced to live with them, although it affects us politically. 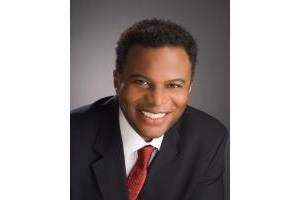 Q187 Andrew Rosindell: I have not mentioned that today. I am talking about which Department you belong under. You mentioned Liverpudlian, Scottish and English earlier. The Falkland Islands and all the Overseas Territories may be British, but in so many ways they are not treated the same as the rest of the British family. Barkman: It is not what you can do for us; it is what we can do for ourselves a bit more. Q188 Chair:I was very interested to hear you say you were happy under the Foreign Office. Chair: It is the best fit. Barkman: It is the most suitable Department, but the door is a bit wider open.